Gnorasi is a new platform for remote sensing image analysis and processing. It is free (as in freedom) software licensed under GPL2, written in C++ and heavily based on OTB. Its goal is to provide a knowledge-based environment for advanced image analysis, and an intuitive graphical environment for easily creating custom remote sensing applications. 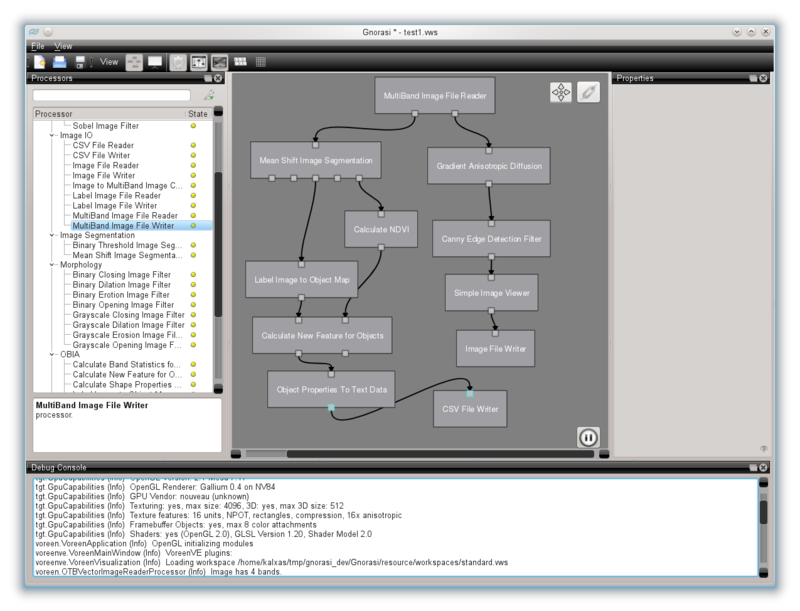 Gnorasi is also based on Voreen GUI and Qt for graphical representation of processing units called processors and for the creation of advanced processing chains. One can easily think of Gnorasi as a class-level GUI (or a GUI wrapper) for OTB. Similar to OTB-Applications and Monteverdi packages, Gnorasi demonstrates what can be done with OTB. 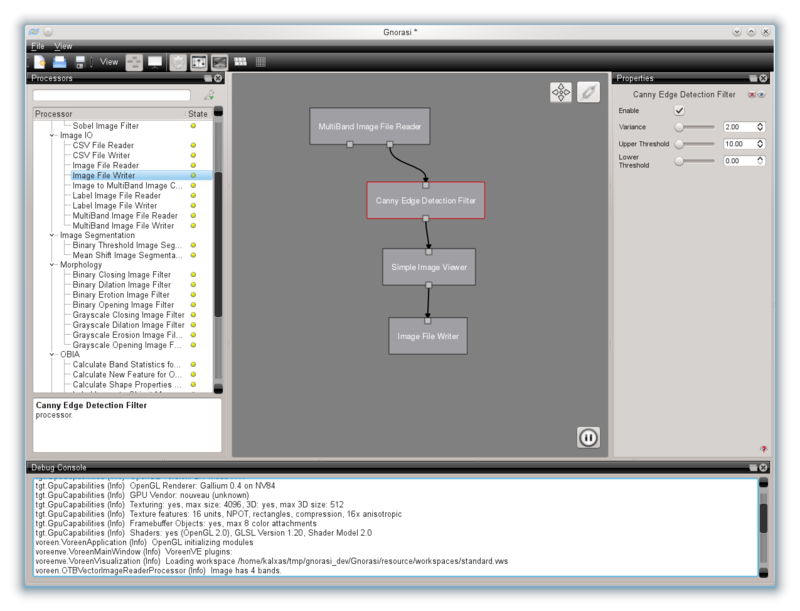 The difference is that Gnorasi makes available OTB tools at a class level (through processor units wrapping OTB classes) which, when combined through I/O ports, they create simple or advanced processing flows. The goal is to finally wrap all OTB classes in processors and make OTB application creation easy as a LEGO game! We believe this will mostly help OTB users with less programming experience and make OTB more popular to end users, since C++ knowledge will not be a prerequisite anymore. At this point Gnorasi is in Alpha development but the application is already usable and can be tested. Right now (version 0.1.9) the main features of the application are: basic filtering, morphology, egde detection, image segmentation, initial OBIA insfrastructure, radiometry and image math processors. We are currently working on bringing new processors to the application as well as contribute new algorithms to OTB so that they are available through Gnorasi too. There is a snapshot git repository for GitHub users here. This repository gets updated only during new version releases. You can also try Gnorasi using our demonstration Live CD or Virtual Machine (password = “user”) prepared using SUSE Studio. Developers, Testers as well as issue reports are welcome!